Cohabitat is devoted to a more intimate and efficient way of living with your neighbours. Photo courtesy of Emily Macrae. When was the last time you asked your neighbour for a cup of sugar? For many city dwellers, the idea of counting on the person next door for a favour (no matter how small) harkens back to another era. But an organization in Quebec City is rethinking the relationship between neighbours, and challenging the definition of developer in the process. At Cohabitat Québec, neighbours can not only borrow a cup of sugar, they can help themselves to dry goods from a common pantry, brew a cup of coffee in the community kitchen, or pick up a power tool from the shared carpentry shop. 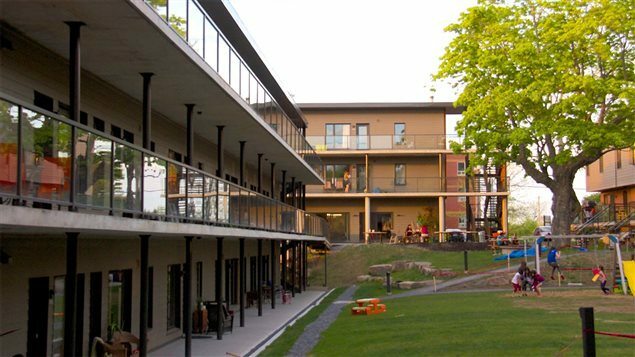 Cohabitat Québec is the first cohousing community in Quebec and the largest in Canada. Cohousing is a movement that emerged in Denmark in the 1960s. The first communities were built in that country in the early 1970s. Since then, the approach has spread around the world and has even been adapted to a high-rise in Antwerp. There are 165 cohousing communities operating in the United States, with 17 others in development. Perhaps because of the history of the co-operative movement, cohousing is a more recent arrival in Canada. The Canadian Cohousing Network lists 14 established examples across the country and several more in the early stages. The design principles that distinguish cohousing create smaller units in order to encourage interaction between neighbours. A community house provides space for activities that otherwise might happen in private homes. This approach has environmental as well as social benefits. 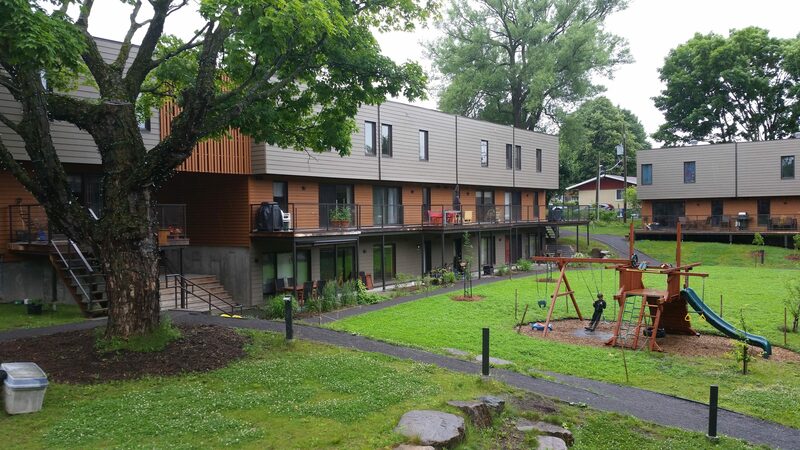 Smaller units in combination with other factors such as reduced parking and choice of building materials mean that Cohabitat Québec is certified LEED platinum for environmental design. In total, Cohabitat Québec consists of 42 units in five buildings, as well as indoor and outdoor common areas. The community house includes an industrial kitchen, a dining room that can seat 100 people, a multipurpose room, two guest suites, and laundry facilities. About 100 people live in 10 two- or three-storey townhouses and 32 one- to three-bedroom condos. In addition to carefully designed spaces, shared activities are at the core of the cohousing concept. At Cohabitat, members volunteer nine to 12 hours a month alongside their neighbours. Some sit on committees to manage issues like maintenance or communications, while others participate in work teams to keep common areas tidy and co-ordinate community meals. If it sounds idyllic, keep in mind that cohousing is an approach that requires significant social and financial capital. Cohabitat Québec cost $11 million to build and took 10 years of planning before welcoming its first residents in 2013. Units are not subsidized and resale prices are comparable to market rates elsewhere in Quebec City. As an intentional community, membership also requires the ongoing investment of time and energy. In the case of Cohabitat, interested individuals must participate in training sessions on consensual decision-making, communication, and conflict resolution before becoming an observing member of a committee or participating in other activities. There are also bureaucratic barriers to setting up a community. In Quebec, building permits have not caught up with the possibilities of cohousing. Although Cohabitat’s future residents purchased their land and oversaw the building process, they fought a four-year court battle to be recognized as owner-builders rather than for-profit developers under the provincial building code. Essentially, unlike other models of residential development, cohousing enables savings from economies of scale to be reinvested in common spaces. Closer to home, Ottawa has been home to cohousing since 1997, while in Toronto Canopy Cohousing aims to build a 24-unit community, but has yet to acquire land. Across Ontario, similar projects are getting off the ground in Waterloo and Perth. As the size and stage of these communities suggest, cohousing is not a solution to the housing crisis. It’s a small-scale approach that requires years of planning, not to mention the purchase of appropriate land and the recruitment of residents ready to commit to a shared set of values. What’s exciting about cohousing is that it enables community members to circumvent private developers and shape dense neighbourhoods that respond to residents’ needs. It also shows how design features, in combination with volunteer opportunities, can reduce social isolation, especially as the population ages. So even if you don’t need to borrow a cup of sugar, cohousing offers a sweet spot between the privacy of your own home and the social ties created through shared responsibilities.